President of League of American Patriots of Henry County believes they prevented possible pro-German mob violence. 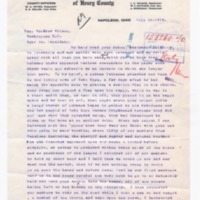 "Communication from Mr. Ritter received at the time eliminated any possible misconstruction upon the patriotic work undertaken by the League"
Our purpose is to crush pro-germanism in Henry Co. to aid the Administration in every way and we have done a wonderful work, we did not reach one-third of our quota in the first and second Liberty Loans, we then organized and the third Loan was a 200 percent one. We have had nineteen prominent persons to appear before the league and explain why they opposed the loans, Red Cross and the Government, eighteen we found guilty and so notified the public, but now since we have adequate laws we are only seeking the evidence. Mr. President, are we doing wrong? [Handwritten note along right margin of p. 2 of this letter reads:] 4400 of our 5800 voters are members. P. G. Prentice whom we voted out of our league for making false reports, F. M Givashner who interfered in the sale of bonds M. Reiser who did the same, L. W. Shultz who took one flap off of an auto. Will write you more. Ritter, W. A., “WA Ritter to Wilson,” 1918 July 26, TI00146, Race and Segregation Collection, Woodrow Wilson Presidential Library & Museum, Staunton, Virginia.